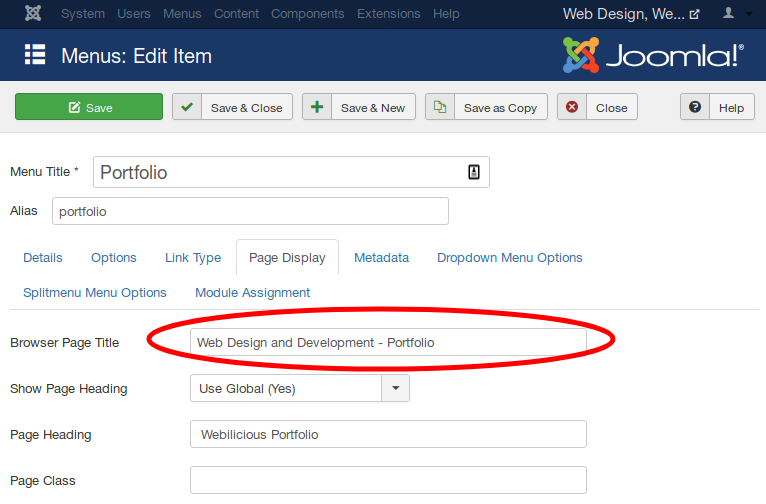 Fortunately, Joomla can do all of the essential steps (1 to 6 below) out of the box without the need for any third party extensions. Using the File Manager in cPanel or an FTP client or similar, rename the htaccess.txt file in the root folder of the website to .htaccess. Log in to the back-end of the Joomla website with an administrator account and go to System → Global Configuration → Site. Add a Site Meta Description. The Site Meta Description is included on pages where no meta description is found for the article, category or menu item. I don't usually worry about Meta Keywords any more as these are ignored by Google. The robots.txt file is located in the root folder of the website and can be updated via the File Manager in cPanel or an FTP client or similar. Enter a unique page title for each page. The best practice for page titles is human readable text, up to around 65 characters, on one line, including keywords, branding and localisation with the main keywords first unless the brand is recognisable and in this case the brand should go first. I tend to enter page titles in the menu option as H1 Headings and Meta Descriptions can also be entered here at the same time. Enter a unique H1 Heading for each page. There should be exactly one H1 Heading on each page and this can be supplemented with H2 and H3 headings if needed. The best practice for H1 Headings is human readable text, 20 to 70 characters, on one line at the start of the article before any H2 or H3 etc headings and with the main keywords first. I tend to enter H1 Headings in the menu option as Page Titles and Meta Descriptions can also be entered here at the same time. 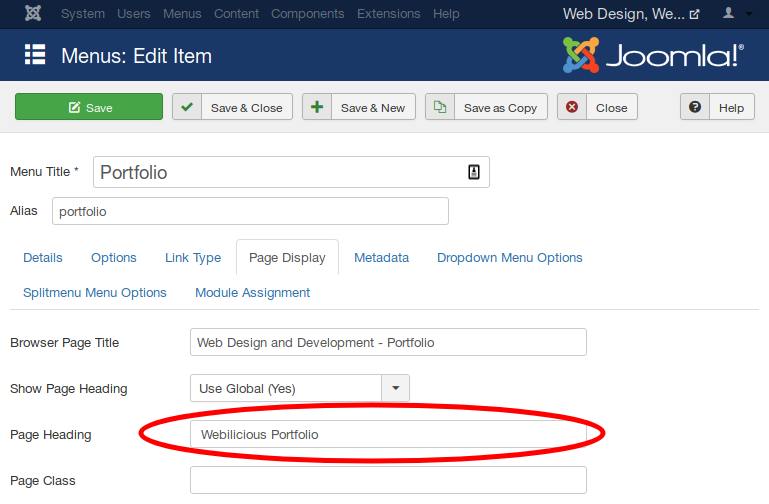 I am assuming that the Joomla Template displays the page heading as a H1 heading but this is template dependent and not always the case. Note that blog articles don't necessarily have their own menu option and in this case, the H1 Heading can be enabled in the article. Enter a unique Meta Description for each page. The best practice for Meta Descriptions is human readable text, 155 to 160 characters, on one line including keywords, branding and localisation and with the main keywords first. I tend to enter Meta Descriptions in the menu option as Page Titles and H1 Headings can also be entered here at the same time. Note that blog articles don't necessarily have their own menu option and in this case, the Meta Description can be entered in the article. Ideally, a Sitemap should be created and submitted to Google Search Console (Webmaster Tools). 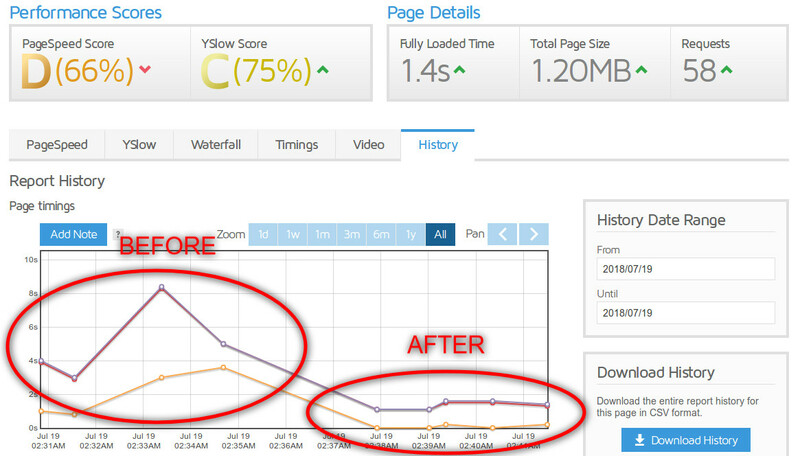 This makes it easier for Google to crawl your website and to make sure that all pages are being crawled and indexed. Google also then has a way to notify you about any problems with the website such as crawl errors. 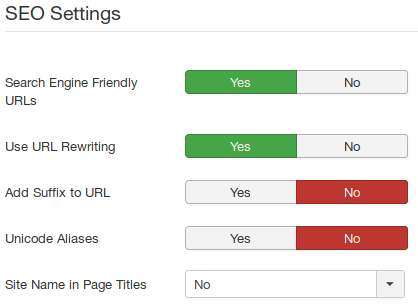 Creating a Google Search Console account is free and easy to do. There will be no more security updates for PHP 5.6 after 31st December 2018. 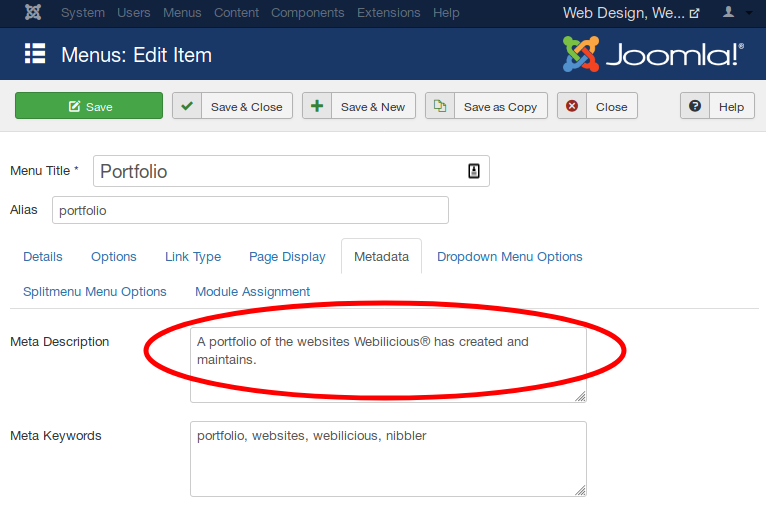 Joomla websites already running on Joomla 3.x should have their hosting updated to PHP 7.2 if it isn't already. (Security support for PHP 7.1 ends on 3rd December 2018). Joomla 1.5 and Joomla 2.5 are not compatible with PHP 7. 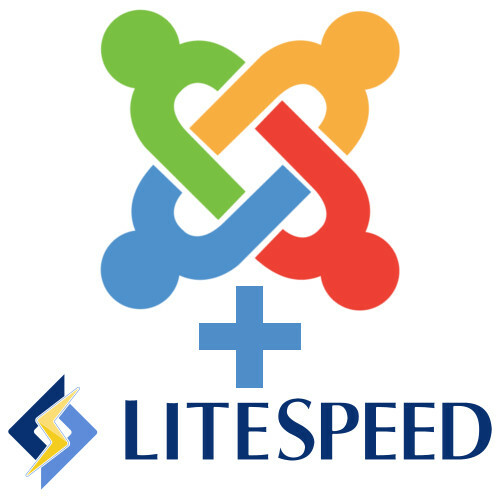 As hosting providers drop support for PHP 5, Joomla 1.5 and 2.5 will cease to function. It's not clear exactly when this will happen and it might depend on the timing and severity of security vulnerabilities discovered after security support for Joomla 5.6 ends at the end of 2018. When your hosting company announces they are dropping support for PHP 5.6, a short term solution may be to move to another host that still supports PHP 5.6 but ideally you should be aiming to migrate any remaining Joomla 1.5 or Joomla 2.5 websites to Joomla 3.x or some other secure platform within the next few months. Another option for a simple Joomla 1.5 or Joomla 2.5 website with few ongoing updates is to recreate the website as a static HTML website as I have done for Graham Woodhouse Conveyancing and similar. A static HTML website can still have all the basic essential features such as a responsive template, SSL, search engine friendly URLs, Google Analytics, search engine optimisation and a contact form. Additional benefits of static HTML websites are faster performance and little or no ongoing cost (apart from the domain name and hosting renewals). What Version of PHP is My Website Running On? What if My Hosting Company Does Not Offer Support For PHP 7? Your hosting company should be running at least one supported version of PHP. If not, you should ask them why not and when they propose to fix the security issue. If there is no sasisfactory answer then you probably have no other option but to move to a better quality hosting company. See https://webhostingdownunder.com.au for help in choosing a new hosting company. Options 1 and 2, where you can choose your own hosting provider, make the most sense to me because you stay in control of your website and your investment is protected. CMS suppliers, template suppliers or hosting companies can go out of business but you can quickly restore your website from a backup to alternative hosting if necessary and continue business as usual. With option 3, the service provider can implement changes at any time with little or no or warning and changes may not suit your particular requirements. If you are not happy with the direction the service provider is heading or if the service provider goes out of business, there is often no easy way to export or migrate your website to a format that can easily be restored elsewhere. Relying on one particular service provider risks the future of your business and the risk increases with the amount invested. Given that I only recommend and provide options 1 and 2 (static HTML websites and content management systems), these are the two options which I compare below. Static HTML websites are best suited for simple websites where the website might only be updated a few times a year. Ongoing maintenance fees cost little or nothing. Content management systems such as Joomla and WordPress are best suited for websites requiring more advanced features or for websites that are updated regularly such as every week or every month. Ongoing maintenance fees start at around AU$39 per month.